This mean-looking bear looks like how I feel, like a dead stuffed bear of a girl. My sister got me this giant bearhead magnet. I both love it, and feel sorry for it. I love it, cuz it's a huge giant bearhead! It's so big, its snout fits in the palm of my hand! 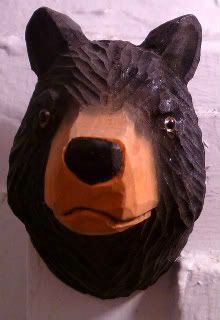 I feel sorry for it, because as I placed it on the wall, I realized it looks like a stuffed bear head on my wall! Even then, it makes me think of Teddy Roosevelt, the great conservationist president with his stuffed animal collection. Still, it's awesome, awesome, awesome. And, it reminds me of how much of a bear I am when I'm on my sickbed. When I woke up this (Friday) morning feeling worse than I have since Tuesday, I was all set to head over to the ER. But then I remembered every late-night phone call that came to the house growing up, rousing everyone out of their beds, and realized that I should just call my mommy instead. Go forage for some medicine or something so you can stop being grumpy bear. Make thy books thy companions.